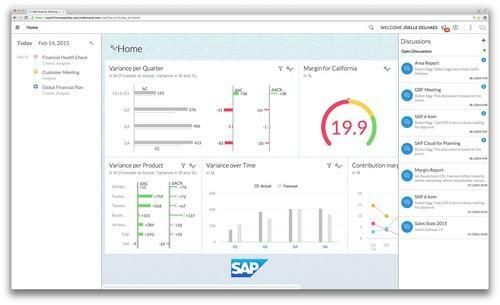 Hard on the heels of the recent announcement of its next-generation S/4Hana enterprise software platform, SAP has unveiled a newSoftware-as-a-Service application aimed at finance professionals but delivering a consumer-like experience. Built natively on SAP's Hana in-memory cloud platform, SAP Cloud for Planning embeds social collaboration and analytics directly within the context of the planning process. The result is that CFOs and other business leaders charged with financial planning can plan, analyze and discuss in context "rather than having to jump to another application," SAP said. "SaaS for anything analytical has been a slow journey, but more is coming out now," said Henry Morris, an analyst with IDC. The reason SAP's Hana and other in-memory engines are useful in this area is that a lot of financial planning works off of "cubes," whereby multiple factors are incorporated in multidimensional-analysis models, Morris said. "The problem is, you have to keep rebuilding these cubes," he said. "It can be complicated, and for planning purposes you often have to go over and over it again." In-memory capabilities, however, mean that such models can be built on the fly, he said. "It's a good application for in-memory technology."